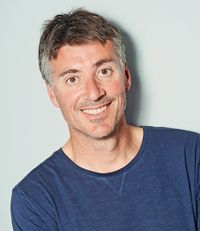 Gregg Dunnett is a British author writing psychological thrillers and stories about travel and adventure, usually with a connection to the coast or to the oceans. Before turning to novels he worked as a journalist for ten years on a windsurfing magazine, briefly owned a sailing school in Egypt, taught English in Thailand, Portugal, Turkey and Italy, taught sailing in Greece and Spain, and also had several rather duller jobs along the way. His brother is the adventurer Jono Dunnett who in 2015 windsurfed alone and unsupported around the entire coastline of Great Britain, and who is currently windsurfing around the coastline of Europe. Gregg lives in Bournemouth on the south coast of England with his partner Maria. They have two young childre Gregg Dunnett is a British author writing psychological thrillers and stories about travel and adventure, usually with a connection to the coast or to the oceans. Before turning to novels he worked as a journalist for ten years on a windsurfing magazine, briefly owned a sailing school in Egypt, taught English in Thailand, Portugal, Turkey and Italy, taught sailing in Greece and Spain, and also had several rather duller jobs along the way. Gregg lives in Bournemouth on the south coast of England with his partner Maria. They have two young children, Alba and Rafa, for whom the phrase “Daddy's working” has absolutely no effect. Gregg's debut novel was an Amazon top 100 best seller in the UK and was downloaded over a quarter of a million times. I’ve been lucky, I spent some years abroad teaching English. I worked in sailing schools in Greece and Spain. I really lucked out with a job testing windsurfing boards for the magazine I grew up reading. I made a questionable decision (ok, a bad decision) to buy a windsurfing centre in Egypt. I’ve also done my fair share of less exciting jobs. Packing and stacking potatoes on a farm, which got me fitter than I’ve ever been in my life. I did a few years in local government which taught me that people really do have meetings that result only in the need for more meetings, and they really do take all afternoon. I spent a pleasant few months in a giant book warehouse, where I would deliberately get lost among the miles of shelves unpacking travel guides and daydreaming. I’ve done a bit of writing too, at least I learned how to write. Boards Magazine isn’t well known (it doesn’t even exist today) but it did have a reputation for being well written and I shoe-horned articles in my own gonzo journalism style on some topics with the most tenuous of links to windsurfing. But the real adventures never came. Nor did the real writing. Then, in 2015, my brother announced he was going to become the first person to windsurf alone around Great Britain. I don’t know why. Apparently it was something he’d always wanted to do (news to me). It was a proper adventure. It was dangerous, it was exciting. Even before he set off he was interviewed on TV, in the papers etc... Some people thought he was reckless, some thought he was inspirational. Lots of people thought he’d fail. But he didn’t. He made it around. He even sailed solo from Wales to Ireland, the first to make the crossing without the aid of a safety boat. I was lucky enough to be involved in a planning level, and take part in a few training sails, and the last leg of the trip. But he did ninety nine percent of it on his own. One step at a time, just getting on with it. That was quite inspiring. I’ve now got two lovely, highly demanding children, so real adventures are hard right now. I still try to get away when I can for nights out in the wilds rough camping, surf trips sleeping in the van, windsurfing when the big storms come. I love adventures with the kids too. To ask Gregg Dunnett questions, please sign up. Gregg Dunnett I realise after publishing one book that I'm definitely still in the aspiring writer category myself. But the advice I try to tell myself is to enjoy…moreI realise after publishing one book that I'm definitely still in the aspiring writer category myself. But the advice I try to tell myself is to enjoy it. There are small successes all the way along the path, even if the path ultimately leads to failure. You wrote 1000 words today - enjoy it. You dreamt up a good character? Enjoy it. Hello all... Just a quick note to say that The Wave at Hanging Rock (kindle edition) will be free this weekend 24/25 September. We’d love your help. Let us know what’s wrong with this preview of The Spy Who Fell to Earth by Ahron Bregman. We’d love your help. Let us know what’s wrong with this preview of Set Free by Anthony Bidulka.